Size: 12 3/4 x 8 1/4''. 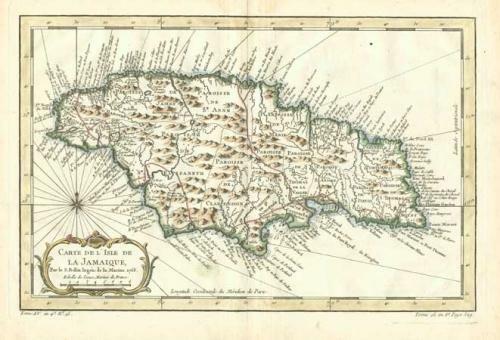 An attractive and detailed French map of the island of Jamaica, showing and naming regional divisions and places along the coast. Jamaica is one of the three islands in the Northern Caribbean forming the Greater Antilles. The country's name is derived from an Aarawak (aboriginal Indian) word "Xaymaca", meaning "land of wood and water". Soundings are shown in the bigger harbor areas. Embellished with mountains, compass rose and title cartouche.